I never thought I would reach a phase where my blog became so much work. It being a Sunday today, I did my usual weekend-morning round of blog-hopping. Only a few out of a very many favourite blogs had new posts up. All around me I see blogs fading away or slipping into quiet stagnation, for whatever reason, and the strange thing is, a part of me wonders if I would be anything but relieved if I quit trying to make this work. Blogging is just a hobby, not deserving of so much drama, I am aware of that. But anyone who knew me back in 2010 can attest to the role Tabula Rasa has played in getting me from there to here. And that is not a thing to scoff at, or give up very easily. And yet, the goal for the year was to post five posts every month, and it must say something about me that on most days, I can't summon the energy to do even that. That being said, one cannot afford to let lack of time lead one to substandard writing. We're better than that, the blog and I. We (yea, I just did that, don't look at me weirdly) have been in kind of an upheaval since I moved away from home, and it is time to face the identity crisis and maybe, shoo it away..
- I don't insist on completing books any more, but I wrote about that already. There was a time when I would say I owe it to a writer to read his work in its entirety before forming an opinion, now I just feel in this worldful of myriad choices, it is the writer who owes me an impeccably written book. Life is too short to read a boring book. - I love rereading now. There is so much to glean from a book when you read it for the second, and the third time. For the fresh version of this blog, I already know things I could write about books I reread that frantically-churning-out-posts-Priya did not do justice to. - I have forty unread books on my shelf, and yet I find myself picking up more and more recommendations from friends and other bloggers. There is a beautiful comfort in buying or borrowing a book someone likes, some assurance of its worth helps me devote it my time. - I have become less rigid, more eclectic in my tastes now. The firm opinions are dissolving, especially on genre. A weird hitherto-unrealized part of me has come to love cheesy romances, I wonder why. I read more non-fiction these days, mostly on linguistics and teaching, but even politics and pop psychology (she shyly admits.) God, I read poetry too. - I am a slow reader this year. There was a time when I would read three books in three days, and be okay with that. Today, I see it as a waste of a treasure-chest of experiences. Do you know what I mean? I now get this feeling that I only graze the surface of a book when I read it at that hasty pace. That I miss out on the so much else that it has to offer. - I am no longer a linear reader, either. I read a page and reread my favourite lines before moving on to the next. I highlight passages and think about them, read ahead and then revisit them to see how reading the next few pages changes my views on the ones before. All these sound fine, you tell me. But what about this - reviews don't make sense to me any more. I don't like writing them. Just what I call these "random musings." That is the crux of my identity crisis - the so-called indelible dilemma. What do you call a book blogger who doesn't read? Moreover, what must a book blogger do when she can't bring herself to write book reviews any more? Well? Stop being a book blogger. I was the one who assigned myself the label, anyway. Which is not to say I won't write about reading. Only that it won't be quite so strictly defined. Through it all, I honestly would like to believe I have grown up as a reader. It is true that have officially lost the right to say, "I read a lot." But I do enjoy reading still, there can be no doubt about that. So, I will commit to writing one post every month, which will likely not be a proper book review. Just one post. But I will make it a damn good one. Good enough for now? This post is part of the Once Upon a Time Challenge. I reread the books. That counts! What do you do when your favourite author dies? When you're done crying, if ever, you read. You read their books. The ones you've read before and any you may not have. You devour every word, like it's their last, because it's their last. And then you spread the word. Nothing I write will suffice to express my immense admiration for Sir Terry Pratchett. I am relatively new to the Discworld series, but I love it and I do believe it is the greatest and most self-aware fantasy writing out there. All I can do is try to explain just why and hope that my gushing recommendation makes you finally add the books to your shelf, or revisit them. I couldn't possibly cover everything I have to say about a forty book series in one post, so I will start with five of my favourite books within it, and my favourite character. Every time I find someone raving about the character of Death from The Book Thief by Markus Zusak, I kind of want to roll my eyes at them and tell them about Death of the Discworld. He looks much like our Grim Reaper, clad in a black robe and carrying a scythe. He talks in CAPS with a voice which you hear directly in your head and which sounds like two concrete blocks rubbing together. Death of the Discworld rides a horse named Binky, rather preferring it to the usual fiery steed that keeps setting his robe on fire and lives in an endless all-black dimension called Death's Domain in a black Victorian-looking house with a black garden. Death has the most interesting story arc. 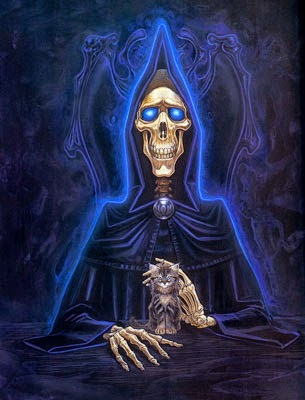 Death, you must understand, is not cruel, only good at his job - he does no killing, we do it. Life ends, he is simply in charge of 'what comes after.' As an immortal outside observer, Death is fascinated by humans, puzzled by their stupidity and their intense grit in spite of it. Often out of concern for their well-being, or sometimes simply curiosity, Death attempts to imitate humans, without really understanding them. Needless to say, this leads to to all sorts of disasters which make the five-part miniseries centred on Death. Pratchett spins marvellous stories around ridiculous what if-scenarios. In Mort, Death takes on a human apprentice, in Reaper Man Death gets fired for having developed too much of a personality and ends up working on a farm instead. Soul Music introduces us to Death's granddaughter, a most amusing girl, who reappears in later books; also, Death rides a motorbike. In Hogfather, when Discworld's Santa Claus goes missing, a curious and worried Death takes his place, to make one incredibly innovative story. In Thief of Time, Time has been kidnapped and Death recruits his granddaughter to rescue it. Through the course of five brilliant books, you watch Death learn ever more about humans and grow to sympathise with them. People often talk about Terry Pratchett and Douglas Adams in the same breath, I have likely done this too, but all they have in common is they both ingeniously churn humour out of genre fiction. Adams fuels his stories with one-liners and quips of such outrage, that it doesn't matter when he leaves the plot unattended to spiral off in mindless directions - in fact, if anything, it only reinforces the self-fulfilling farce, that nothing goes according to plan, that plans don't matter. Whereas, Terry Pratchett clearly cares about the craft of his stories as much as the message he sends through them. And this is because he does not write simply a zany story of a universe, or a planet, even one as extraordinary as the Discworld - which is a turte swimming through space with four elephants on its back who carry a magical disc-shaped world on their backs. Pratchett's books are about the many endearing oddballs living on the strange planet. Discworld is about people and making a difference; it is not Adams's clever exercise in futility. You can see this in the attention and respect Pratchett gives his version of Death. Discworld arises out of passion, not cynicism. It is satire, biting social critique, but with an unmistakable undercurrent of hope. This is its greatest achievement. I wanted to make this a clear three-reasons sort of post, but when it comes to the Discworld series, I can't help but ramble on. Anyway, here, as succinctly as I can put them, are three reasons you must read the Death miniseries of the Discworld. Terry Pratchett was a man who redefined death, in more ways than you could imagine, which makes Mort as good a place as any to start reading the Discworld series. 1. Death will make you laugh. THAT’S MORTALS FOR YOU, Death continued. THEY’VE ONLY GOT A FEW YEARS IN THIS WORLD AND THEY SPEND THEM ALL IN MAKING THINGS COMPLICATED FOR THEMSELVES. FASCINATING. 2. Death will make you think. “You're saying humans need... fantasies to make life bearable." (...) TAKE THE UNIVERSE AND GRIND IT DOWN TO THE FINEST POWDER AND SIEVE IT THROUGH THE FINEST SIEVE AND THEN SHOW ME ONE ATOM OF JUSTICE, ONE MOLECULE OF MERCY. AND YET, Death waved a hand. AND YET YOU ACT AS IF THERE IS SOME IDEAL ORDER IN THE WORLD, AS IF THERE IS SOME...SOME RIGHTNESS IN THE UNIVERSE BY WHICH IT MAY BE JUDGED. Well, of course not. DEATH IS WHOEVER DOES DEATH'S JOB. Did I mention Death likes cats? Seriously, read the books. Any Discworld fans here (hopeful voice) who agree? If you loved Terry Pratchett, and haven't already read this article, you should - There is no Past Tense of Terry Pratchett by Scott Lynch.